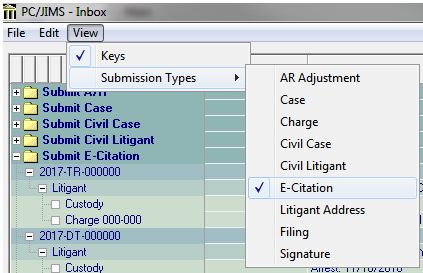 Electronic citations will appear in the Clerk’s inbox and will remain until they are approved. Complete the following steps to approve and process an E-Citation in PCJIMS. a. Approve each complaint by checking the “approved” box. b. To edit the Record Sheet entries > right click on the line below it and select edit. a. Save to process the citation. If it is rejected, it will not be processed and will not show up in the Clerk’s in-box. b. If the system locks up, print the ticket > reject > manually create the case in PC JIMS. 4. “Add” screen appears. Verify information. a. The following information must be included for the system to process the citation. a. This screen will appear multiple times if there are multiple complaints. The “Submit E-Citation” folder preferences can be set so the folder remains open at all times. To set this preference, open the in-box and select View > Submission Types > E-Citation. · New tickets appear in the in-box until they are approved and processed. · If a ticket appears in the Clerk’s service provider folder (i.e. APS or digiTICKET), but does not appear in the PCJIMS in-box, contact GAL.